Being a restless survivalist, I find the endless pursuit of the best single knife to be both a noble one and and endless one. Or so I thought. The Fällkniven A1 Pro may have brought an end to my quest for the perfect survival knife, and become the life-long quest of other like minds. 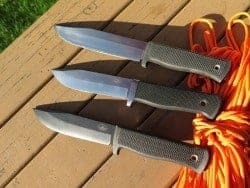 Could the Fallkniven A1 Pro be the best survival knife? 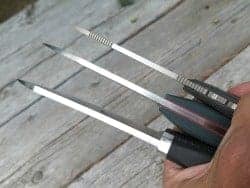 The knife to end all survival knives? Let’s consider it. 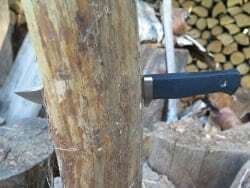 Is the Fällkniven A1 Pro the Ultimate Survival Knife? The Fällkniven knife company has decades of experience at the unique and effective intersection between necessary traditions and technological innovation. Some knife brands lean so far to the innovative side that they never quite fully bake an idea while others swing the pendulum too far the other way and hold a knife design to archaic steel and features that work well, but are far from what’s possible. Not that I’m encouraging the use of performance enhancing chemicals, but I am thrilled that Fällkniven has put its indomitable and proven A1 knife on steroids. And the results are astonishing. What makes the A1 Pro survival knife so amazing is that Fällkniven took an already amazing knife and made it even more amazing. And as one who considers himself an aficionado of survival knives, I don’t say this lightly. The Fällkniven A1 Pro is related to the A1, but kind of alike a tough kid that has a Navy SEAL for a big brother. The A1 Pro is a complete and total upgrade of already high performance option. 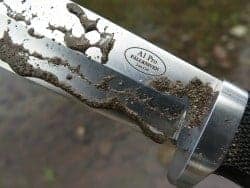 Taking a step back, let’s look at how the Fällkniven A1 Pro came to be, and why the A1 Pro will not have be a serious contender for the World’s Best Survival Knife for a long time. Fällkniven began building on the Swedish blade traditions back in the early 1980’s. It’s F1 knife was chosen as the singular survival blade for the Swedish Air Force. 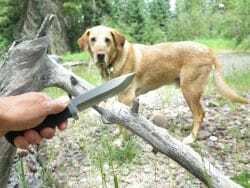 And the F1 also gained respect and notoriety as an excellent solution when a smallish survival knife is needed. What makes the F1, and later the A1 and now the A1 Pro such definitive blades is their steel technology. And a few other things. Jumping ahead, the Fällkniven A1 quickly became a survival success story by providing the essentials and much more. By laminating two supersteels, into a configuration that makes it not only outperform most other high end blades, but its combination of blended steels in a single blade puts the Fällknivens out of reach of other knives in overall strength, raw performance and technical prowess. But what happens when a purveyor of extremely high end blades takes a step back and assesses the performance of its own best edges, then turns up the volume on one of its best sellers and highest achievers. Well, I guess you get the A1 Pro. So it’s official. Fällkniven goes to 11! The Fällkniven A1, the original one, was a test bed for all things survival. It pushed the limits of laminated steel giving the serious knife user a glimpse of what’s possible when performance outweighs tradition. From that point on, the world got a taste of things to come. Now imagine Fällkniven taking everything good about the A1 and pumping it full of steroids. The passing similarities between the A1 and the A1 Pro are only apparent from a distance. While the grip size is the same, the material is different and the sometimes-debated finger guard shape is reversed. And best of all, the already thick blade is even thicker and made of a ultra-high end cobalt-laminated steel. The sheath is beefier and stronger. The edge is a more refined convex shape. 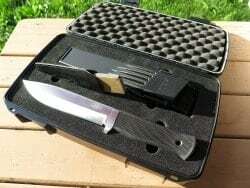 And the knife comes in a presentation box that doubles as a waterproof container complete with Fällkniven’s professional quality diamond sharpening stone, the DC4. The A1 Pro contains a core of cobalt steel rather than the VG10 of its father. Cobalt steel (CoS) contains about 2.5% Co, along with a slightly higher chromium content. This magic mix of alchemy provides a better edge that stays sharp longer while hovering around 60 on the Rockwell (HRC) Scale. Cobalt steel is not a recent phenomenon for Fällkniven. It was experimented with in prior Fällkniven knives including the KK and the PC. As the results came in, it was clear that cobalt steel was the next go-to steel when the best was desired. Add to that an “Improved Convex Edge” and you are on the literal and figurative bleeding edge of cutlery technology. 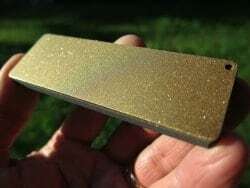 Cobalt steel blades truly are playing with sharpness at the molecular level of steel, not just the crystalian level. In other words, sharp is a cousin, and cobalt steel is your filthy rich uncle. Seven is the new norm. At seven millimeters thick the blade has added strength beyond the already ridiculous strength of the regular A1. And that strength has extended into the grip with a thicker and wider tang that, like the A1, extends the all the way through and out the other end. Fällkniven admits that to claim something “professional” requires a corresponding and honest raising of the bar. And Fällkniven delivered to an astronomically high level. At the time of this writing, the Fällkniven website shows the A1 Pro as “sold out.” Think about that for a moment. In a world hip-deep in survival knives priced from the same as a couple gallons of gas to more than a car. 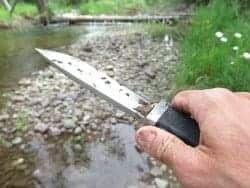 Then Fällkniven comes along and makes survival knife along with its dozen other survival knives already on their resume. And this newcomer sells out before most folks even hear about it. 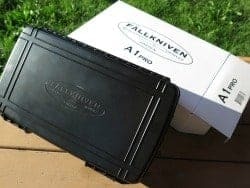 The Fällkniven A1 Pro arrives inside a black watertight plastic box complete with foam liner and embossed lid. Inside the box is the Fällkniven A1 Pro knife, it’s sheath, and Fällkniven’s DC4 diamond sharpening stone. The box is a nice touch and Fällkniven encourages its use for storing other things like electronics. It’s not quite a Pelican but certainly more than a Plano. The stone is an excellent choice. In addition to high end survival knives, Fällkniven also makes top notch kitchen cutlery and the tools to keep them razor sharp. The DC4, or Diamond/Ceramic 4-inch stone has a gold diamond surface of 25 micron grit on one side and a synthetic sapphire ceramic stone on the other. In addition to being able to sharpen the hard laminate supersteels, no lubrication is needed for smooth sailing. The zytel sheath is an upgrade over the standard A1 model. The Pro sheath is beefier with more pronounced strengthening fins. It also is more adaptable to MOLLE and other attachment systems with its inch-wide wings that will accept horizontal straps. The Pro sheath uses the same riveted strap for a belt loop and friction retention. In lieu of the thumb ramp present on the classic A1 sheath, the strap’s ear has the job now. Even a cursory glance at the A1 Pro says this knife is all business. From the grip to the guard to the blade to the frighteningly thick spine, this knife demands respect. At 11.2 inches overall length, the A1 Pro is not for the faint of heart or for those with low muscle tone. 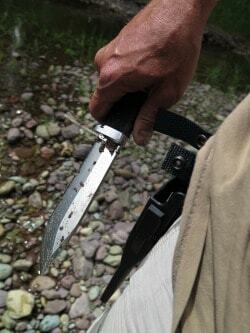 The 6.3 inch blade, while not the longest tool in your bug out bag, is actually plenty for any confrontation with a human or larger critter outside those of the Grizzly variety. Like the regular A1, the tang of the A1 Pro extends throughout the grip and out the top. However, Fällkniven did upgrade the tang by making it larger, thicker and tapered. But the real change is in the finger guard. On the regular A1 the guard was covered in the same Kraton plastic as the grip, and leans just slightly back towards the hand. The finger crossguard on the A1 Pro is polished, stainless steel, thicker welded to the frame, and opens out towards the blade. Why this is important is due to some index finger strain when using the regular A1 for repetitive long-duration woodworking tasks. Fällkniven is apologetic about the price of the A1 Pro. They defend the higher cost of the A1 Pro (presumably compared to the regular A1) because of the more expensive steel, more expensive grip and guard, and more expensive containment and sharpening solutions included with the A1 Pro. But frankly, if one compares the A1 Pro to anything custom, the A1 Pro seems mainstream in its pricing. Either way, at the time of this writing, Fällkniven lists the A1 Pro as “sold out” so discussion about price are somewhat recreational. Personally, I find the price of the A1 Pro completely reasonable, but like any pro-level piece of equipment, it only seems expensive if you don’t have the skills to extract the benefits from it. 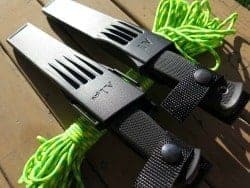 Like many preparing for SHTF events and the likely WROL that will follow, I’m always looking for the next big thing in bladeware. Until now I was restless, always looking over my shoulder to see what else was out there. But with the A1 Pro in hand, a calm settled over my quest for the ultimate survival knife. 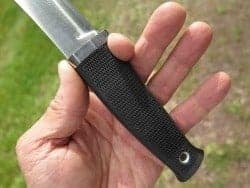 Fällkniven’s Pro version of one of the world’s best survival knives, their own A1, as moved the bar so high that most general arguments are moot. With the Fällkniven A1 Pro on the scene, the quest for perfection is now simply a question of preference.